The folks at OverDrive posted a 10 most frequently asked questions article today with some helpful tips for librarians and people that get ebooks from public libraries. Number ten on the list highlights a feature that I didn’t know existed. Some public libraries allow customers to recommend specific ebook titles for the library to purchase and add to their online catalog for lending. After you recommend the ebook, you even get the option to get notified by email or place the ebook on hold if your library decides to purchase the title. Not all public libraries offer this recommend feature. Mine doesn’t—that’s why I didn’t know about it. Here’s how to see if your library offers a recommend feature, and how to make use of it if they do. If you are new to getting ebooks from libraries, see this earlier article for more information: How To Get Free eBooks From Libraries Using Overdrive. From the OverDrive ebook section of your public library, you can choose to view “Additional Titles to Recommend” from the search results page after running a search or from the different lists for categories and sections. Once selected, recommendable ebooks get added to the search results. Then you can choose to recommend titles by hovering over covers. Choosing to recommend a title for your library to purchase opens a window where you get the option for email notifications and to place the title on hold if your library purchases it. Apparently some libraries set limits on how many titles you can recommend during a certain time frame. 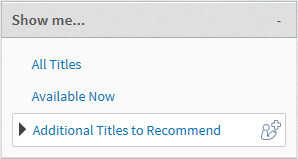 You can view the list of titles that you tagged as recommended by visiting your Account > Lists > Titles. You can refer to the OverDrive help article for more information about how to recommend titles for your library to purchase. Sorry to hear your library does not allow recommendations. I believe all libraries allow recommendations. I have recommended more than twenty four books thru the app and I request ebooks via my library’s website. 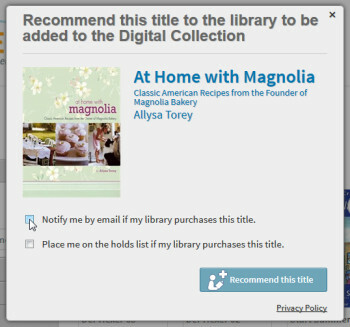 On your library’s website there should be an area to make a suggestion. Another way is to call or visit your library. You should be able to request ebooks at the help desk. What about buying the book for your library? Is that something anyone has done and if so, are they higher priced than normal purchase of the book? Once I’ve read a book, there aren’t many I’d go back and read again. I’d just as soon buy it for the library and read it when I get the chance. Quite frankly that’s one of the best ideas I’ve heard, but unfortunately common sense like that doesn’t apply to entities like big house publishers. Libraries have to pay a lot more for an ebook copy than we do, and some publishers only allow an ebook to be borrowed 26 times before the library has to buy the license again. Here’s a good article with more info about it.